Pure Evil, Eine and Nelly Duff are the team behind a forthcoming exhibtion opening this week the 6th December. 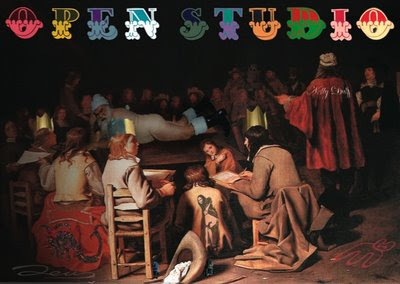 The "OPEN STUDIO : FOR LIFE, NOT JUST FOR CHRISTMAS" exhibition will act as an open studio in the heart of Shoreditch, East London and will feature contemporary street artists at the top of their game who will work on developing new artworks within the space during the exhibition. Live painting, films , discussions and workshops… Music , Lights , Action are all promised at this event!!! Prints and originals will be for sale throughout the event, but the focus will be on Art not Commerce.. what a concept !!?? The show preview party on the 6th of December begins with a row of blank canvasses that will be worked on and developed throughout the 3 week residency and there will be a big Conclusion party on Thursday the 20th when the finished artworks will be on display. Some of the features artists include: Eine, Pure Evil, Toasters, Other, Solo One, Dave The Chimp, Calma, Nick Walker and Fefe Talvera to name a few. 6 th to 20th December .